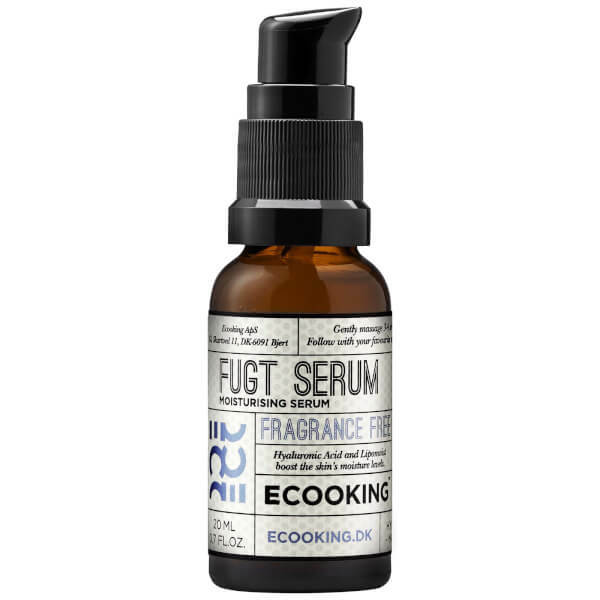 Improve your skin's overall appearance with the Moisturising Serum from Danish skincare brand, Ecooking. Enriched with Hyaluronic Acid, the weightless formula absorbs quickly into skin to replenish optimum levels of moisture and hydration, without leaving a greasy or sticky veil. Perfect for dry, mature skin, the luxurious serum rejuvenates and promotes a youthful-looking complexion. Pump a couple of drops of serum into the palm of the hand and apply gently using your fingertips. Aqua**, Propanediol, Glycerin*, Sodium PCA**, Xanthan Gum, Sodium Levulinate, Citric Acid, Pseudoalteromonas Ferment Extract, Potassium Sorbate, Caprylyl Glycol, Phenoxyetahnol, Sodium Benzoate, Hydrolyzed Wheat Protein, Ethylhexyl-Glycerin, Hydrolyzed Soy Protein, Butylene Glycol, Sodium Hyaluronate**, Lecithin, Tripeptide-10 Citrulline, Glucose, Carrageenan, Carbomer, Triethanolamine, Tripeptide-1*.